Hiking doesn’t necessarily mean you have to deprive yourself of the minimum comfort of your civilized existence. 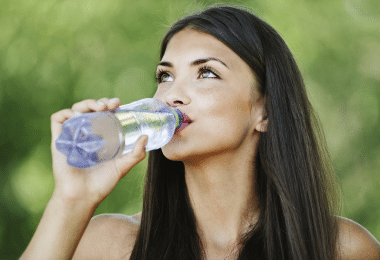 So you don’t have to suffer from thirst or hunger, nor should you only eat cold food. Conversely, getting at least two warm meals per day, for instance, breakfast and dinner, gives you more energy in the morning and a better sleep at night. 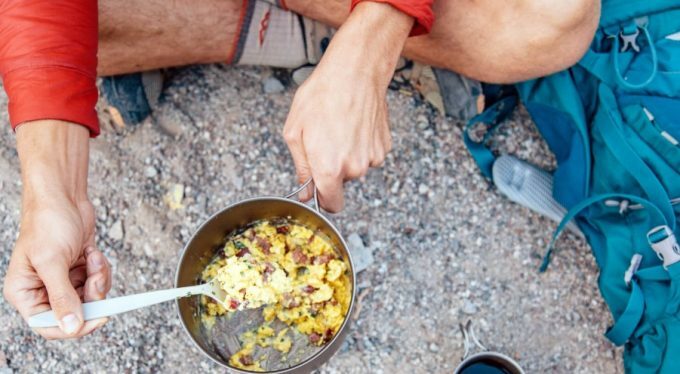 That’s why you should know how to keep food warm during hiking, so you’ll spend less time with the preparation and heating of your food, and more time on the trail. And there are a lot of ways you can do that, just keep on reading to find out which work best. 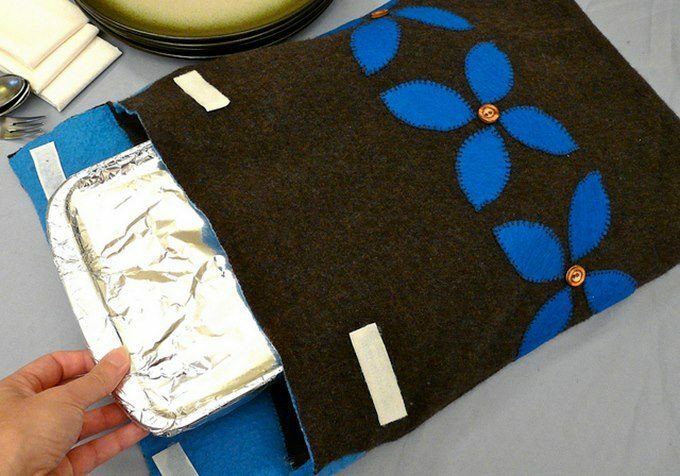 One great way of preserving warm food items is by keeping them insulated in a box filled with towels. Get a box that’s big enough for your pot or pan to fit inside. Take four medium-sized towels or two larger ones. Place the towels in the box, so that they’re overlapping on the bottom of the box, while their corners stick out. Place your pot or food inside the box. 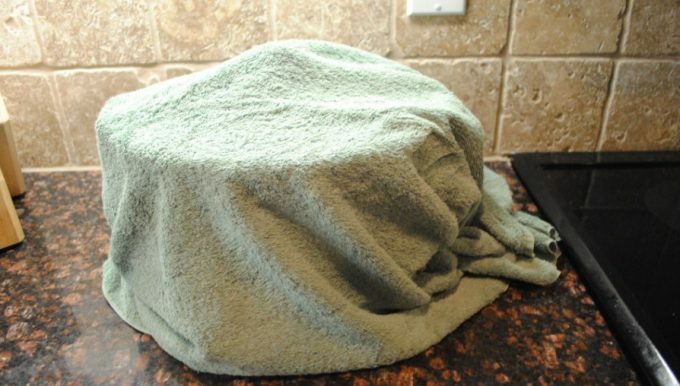 Fold the corners of the towels on top of your food. 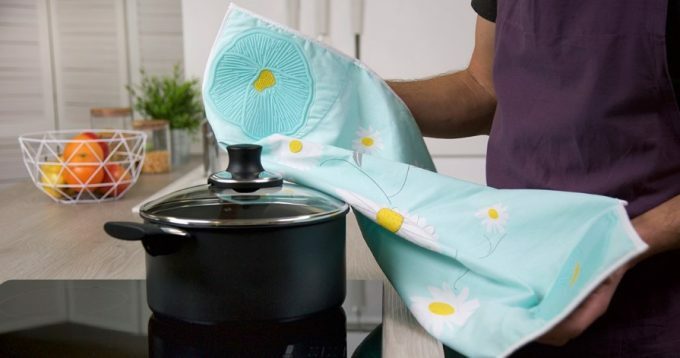 If your food isn’t just warm, but downright hot, the heat will tend to rise up, so you need an additional towel or other insulating fabric above it. If you have cold food, don’t place it on the floor, but on the seat beside you. Also, don’t put the cold food you want to keep cold at the bottom of your backpack, but at the top. Disregard this advice if you want to warm up your cold food. If you’re traveling by car, place the box on the floor. That way, since the floor of your car, tends to heat up, and heat rises, it will keep your food warmer for longer. If you’re traveling by foot, place the box at the bottom of your backpack, and your clothes on top so they act as insulators. This method works like a charm for at least three hours. Some heat will be lost through the carton of your cardboard box, as well as through the towels. If you want to prolong this time, get more insulating towels, not from cotton, but from fleece. 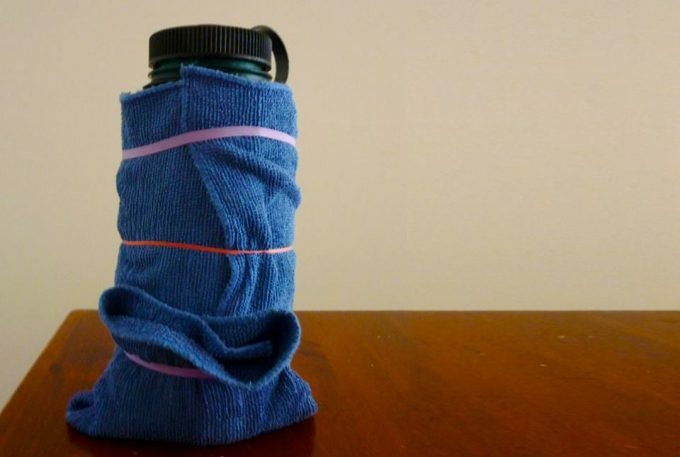 You can even replace the towels in this method with other things, like insulating hiking clothes, even something that’s windproof and waterproof. The reason is that clothes which are resistant to the elements will prevent air and heat circulation. 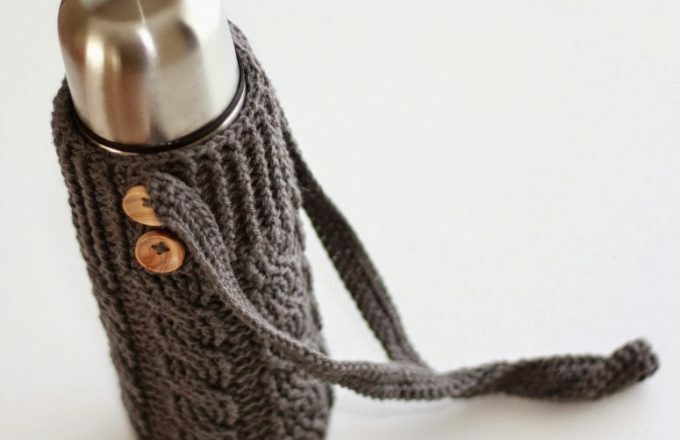 That will trap the heat inside, helping your pot stay warm. If you’re hiking instead of traveling in your car, you might need some other way instead of the box and towels method. At this point, a sleeping bag works even better than the box, because it’s more insulating, as well as more portable. Wrap the food in a warm blanket. Put this pack at the bottom of your backpack. Place other things on top, so the heat doesn’t get out through there. Or, if you don’t have other stuff with you, fold the backpack onto itself at the top. If you have cold food, the backpack should be folded at the bottom, so that your food stays cold. This method works very well, it helps keep the temperature of your food for about five to six hours, until your next meal. The reason is that both the blanket, the sleeping bag and the backpack are manufactured from insulating materials that prevent heat loss. Yes, you’ve read that right. 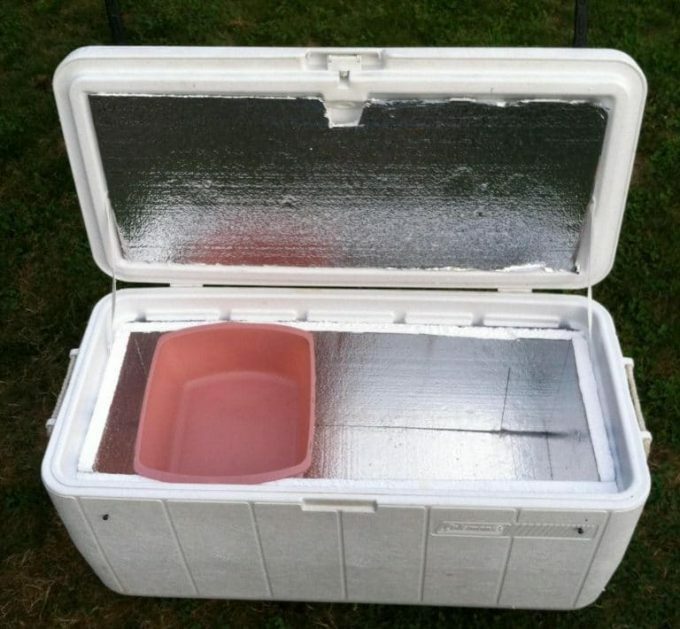 Coolers aren’t just for keeping your food cold if you use them the right way. Get a few insulating bags. Place your casseroles inside these bags. Put the bags inside the cooler. 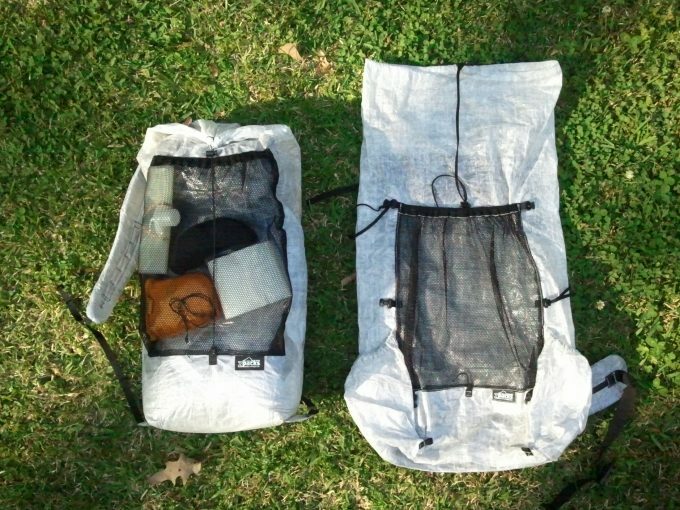 You can also use clothes, towels or a sleeping bag instead of insulating bags, but these work better. 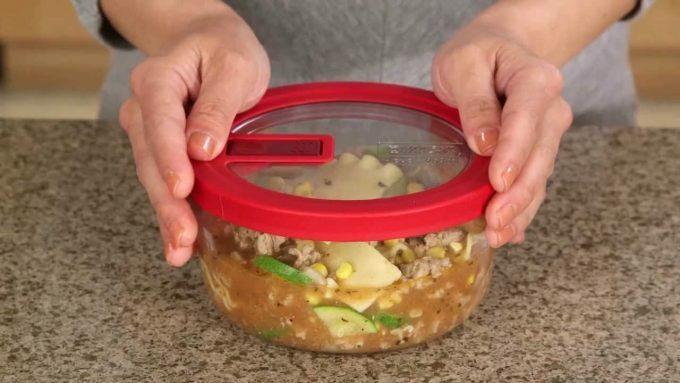 If you want to keep your food warm, always close the top lid. Place other insulating materials on top of the bags if your food is really hot. You have a smaller cooler. You’re hiking with more people and you can split the luggage between you. 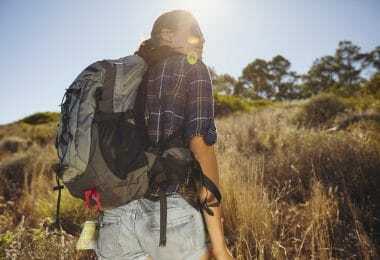 You’re not hiking on a rough trail, so you can carry a small cooler in your hand. We love ceramic dishes because these are awesome insulators. Ceramics doesn’t conduct heat, thus keeping a decent thermal mass. So if one of your priorities during hiking is maintaining your food warm, you should replace any metal dishes you might have with ceramic ones. The obvious downside here is that ceramic pots weigh a lot more than metal ones, so they’re not all that great for portability reasons. But if you’re willing to sacrifice portability in favor of a warm meal, ceramic will improve your chances to fill your stomach with something hot at your next stop. Simply carry your food like that, without doing anything else. This will help it stay warm for a couple of hours. Replace the metal pots with ceramics to use for the previous two methods. That will increase the timespan for maintaining your food at the desired temperature with one to two hours. Use bath towels to cover your ceramic pots, placing them in an “X” around the pot. This protects both the top and the bottom parts for added insulation, so the heat remains trapped inside the towels for longer. The reason is that air circulation is slowed down quite a lot if you’re not folding the towels parallel to each other. Buy a hot pack and warm it up in boiled water, in the oven or use the microwave. Place the ceramic bowl inside, and you’re bound to hit the 10-hour mark regarding your food’s temperature. Pyrex glass is another good insulator since it preserves the thermal mass. You can get a plethora of dishes and casseroles manufactured from this great material online, the upside being that it weighs a lot less than ceramics does. 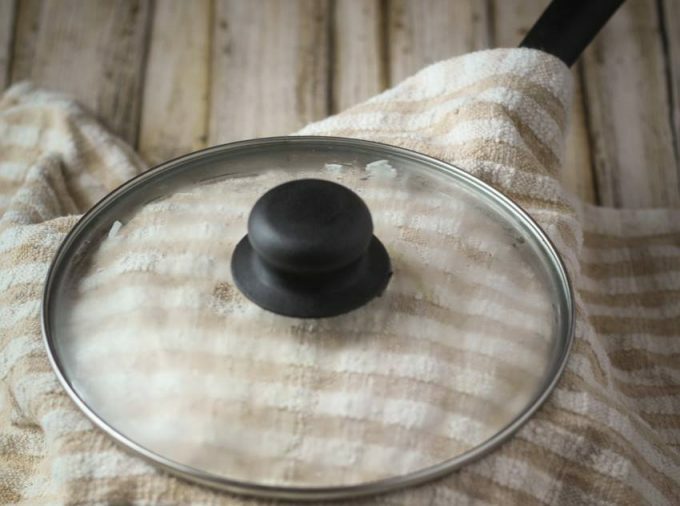 The downside is that Pyrex glass is less sturdy than ceramics, but you can wrap it in some thick bath towels or a fleece blanket so it won’t get damaged when you’re hiking. Just carry your food inside them, without adding anything else if you’re planning on eating sometime in the next couple of hours. 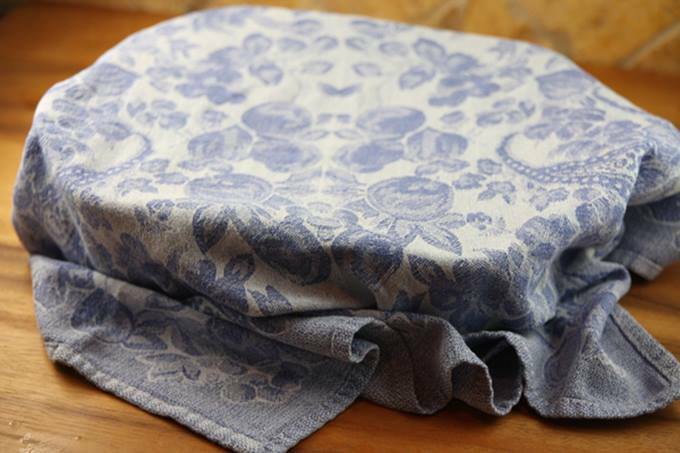 Wrap these dishes in towels, blankets or sleeping bags for extra insulation. This should hold you until the next meal. Use insulating bags or hot packs so you can eat a warm meal about 10 hours after you’ve started your hike. Use towels or fleece for extra insulation during prolonged hiking. Don’t wrap the dishes in towels if you want to use the handles if you’re hiking on short distances. Towels also work wonders when it comes to stabilizing the pot at the bottom of your backpack. There are some important concepts that explain why the above methods work, and it’s important to know the physics behind this. Why? Say you’re in the wild and you’ve forgotten our advice or don’t have some of the equipment with you. Find new, better ways for having a warm meal. Improve the methods we’ve already presented above. We’ve referred to thermal mass before in this article. This measures the quantity of heat retained by an object, therefore how much warmth can be stored by your pot. Use heavier things to carry your food in, if you want it remaining hot for longer. Use lighter things for storing your food if it’s just warm instead of hot. Any sort of light metal. Get a bigger pot so more food can fit inside it. That way, you’ll increase the total mass of the pot and maintain the food temperature. Get a smaller casserole and split your food items. That will decrease the overall mass, as well as the thermal mass of your meal. Basically, heat retention is better when your object is heavier. If thermal mass regards to heat retention, heat conduction refers to the quantity of heat that can escape through a certain fabric or material. These don’t let the air pass through them, so they keep heat trapped inside. That’s why we’ve advised you to wrap your dishes in towels, blankets, clothes or sleeping bags. Another good way to prevent heat loss is by using paper. You know how some homeless people survive very low temperatures by covering themselves up in newspapers when they’re sleeping? You can do the same thing with your food. How can you tell if a certain pot or pan is a bad insulator? Think what happens to it when you place the food inside. Does it get warm fast? If yes, that means the heat from the food is transferred to the dish, instead of staying inside your meal. At this point, covering your pot in one of the above-mentioned materials is highly indicated for having warm food for longer. 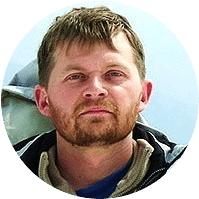 Conversely, a trick to finding a good insulator is answering this question: does your food stay at a decent temperature for at least two hours when you’re winter hiking? If yes, you’ve got yourself a winner. Towels or a small blanket. Wrap the cotton wadding in newspapers. Place the newspapers at the bottom of your box. Add the Styrofoam for extra insulation. Put the towels on top of this. Add your pot or dish. Put some more towels or a small blanket on top of the pot. The bottom is covered with really good insulators that trap the heat inside. You have three layers of insulation so that thermal mass is preserved, although the cardboard material for the box isn’t really top notch. The upper part of your box is covered with another good insulator, so that heat doesn’t escape through the top part. Wrap each brick in tin foil. Put the bricks in the oven at 350° for half an hour. Get the bricks out carefully and place them at the bottom of your box. 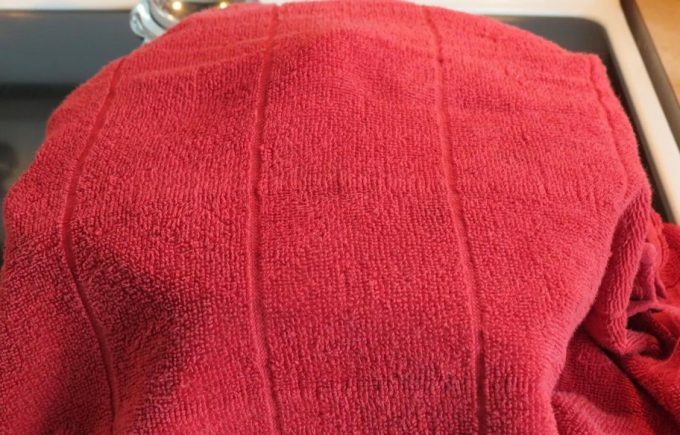 Place one of your towels in hot water or in the microwave to make a sort of hot compress. Add this over the bricks. Get other towels around it, so the pot is secured inside the box. Place more towels on top of the pot. Add the couch pillow over this for extra insulation. 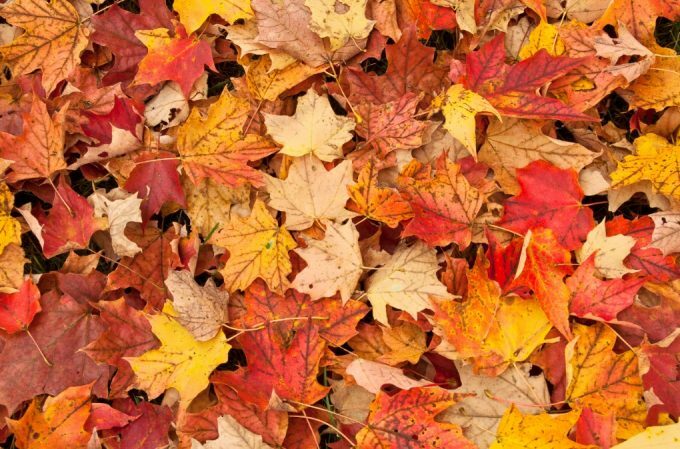 Grab as many dry leaves as you can. Wrap them tightly in a fleece jacket. 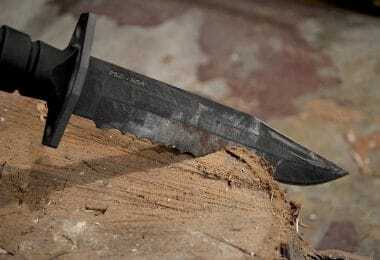 Place this at the bottom of your sleeping bag. Fold the thermal blanket on top of this. Cover the pot with your second fleece jacket. Fold the sleeping bag on top for extra insulation. Don’t collect green leaves, because they will let the heat pass through them. The reason is that they contain a higher amount of water, which is a heat conductor. As such, water does a bad job at retaining heat. This isn’t a standalone insulator, but you can successfully use it with some of the previous methods of building your own insulation. The basic idea is that heat loss occurs through the top of your pot mostly because heat has a tendency to rise, so you need to secure the lid better to have warmer food. A blanket, towel or jacket. Make a campfire and heat the rock inside it. 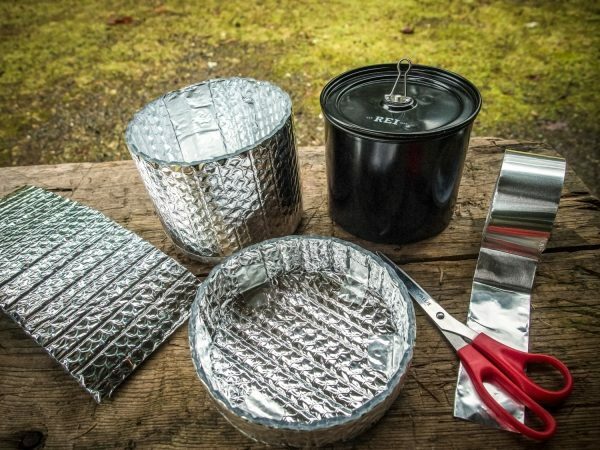 If you have a camp stove, you can use that instead. Get the rock carefully out of the fire. Wrap the rock it the blanket. Place this on top of your pot. This method works perfectly because there’ll be no cold air on top of the pot to allow heat dissipation. Plus rocks are bad heat conductors, which makes them great insulators. These methods really work, and if you also understand why, you’ll be able to invent new ways of maintaining warm meals too. Make sure your food is as hot as possible when you’re putting it inside the pot. Have all your other stuff handy so you don’t waste any time looking for them. Use tinfoil for extra insulation if you’re at home. Don’t leave any room for air ventilation, that equals heat loss. Make sure both the top and bottom are well covered, it’s even more important than wrapping the sides on your pot. For the top backpacking method you can try, see our article on this right away. 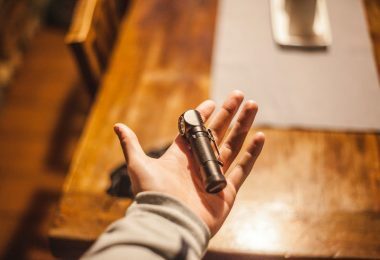 With that being said, we’re curious if you’ve tried some of these methods before. What worked? What didn’t? What would you recommend others? 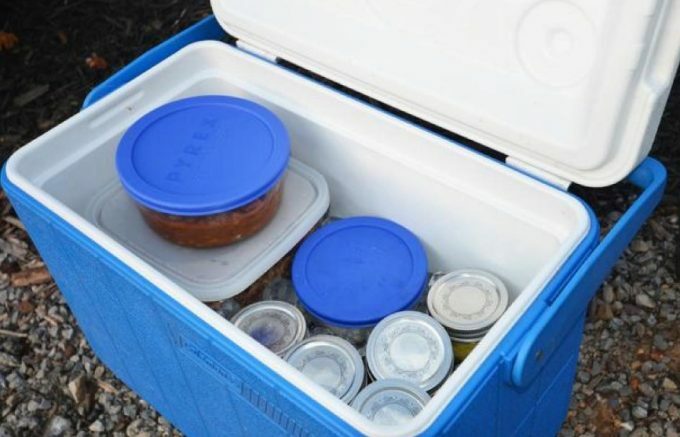 Do you have other ways of keeping your food nice and ready for your next meal when your hiking? The comments are right below!